In The Age on the weekend, I was surprised to find a full page article on the baiji a favourite animal of mine. I'd been reading the Baiji Org site (the source of the above picture) for a while, so I knew a major search for survivors was about to begin. "A team of the world's leading marine biologists is making a last-gasp search for the baiji, a dolphin that was revered as the goddess of Asia's mightiest river but is now probably the planet's most endangered mammal. In the 1950s, there were thousands of baiji in the Yangtze. By 1994, the number fell below 100. This year, there has only been one, unconfirmed, sighting." 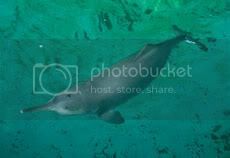 "A lot of people outside China have probably never heard of the Baiji dolphin before. This is a pity because even though it is one of the rarest animals on earth, it is also one of the most interesting and beautiful. First of all, unlike most other Cetacean species, (Cetaceans being whales, dolphins and porpoises), it lives exclusively in a freshwater ecosystem, namely the Yangtze River." As with so many areas of zoology, my introduction to the baiji was in Bernard Heuvelmans' cryptozoology book On the Track of Unknown Animals - he names the date of scientific discovery as 1918, but other sources state 1914 (though local Chinese fishermen were long familiar with them). Then I remember being amazed by photographs of this elusive and beautiful animal in a World of Wildlife encyclopaedia I collected week-by-week in my teens. 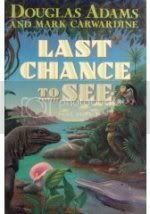 Many years later I was reminded about the baiji by the chapter, Blind Panic, in (the late) Douglas Adams and Mark Carwardine's Last Chance to See. Adams writes of the baiji's perils: "constantly being mangled in ship's propellers, snared in fishermen's nets full of hooks, blinded, poisoned and deafened." On putting a microphone into the ever busy river, he wrote: "Instead of hearing the roar of each individual ship's propeller, what we heard was a sustained shrieking blast of pure white noise, in which nothing could be distinguished at all." The book includes some good pictures of Qi Qi, the male baiji resident at Wuhan Institute of Hydrobiology from 1980 to July 14, 2002 (he was apparently found in Dongting Lake - where the 1914 one was found - severely injured by a fishing hook and nursed back to health using Chinese traditional medicine). Qi Qi was exceptional in surviving well in captivity. While captive breeding presented the only hope, it is sadly familiar - remembering the thylacine - to have the last known specimen of an incredibly ancient species die in captivity. For a good overall written account of what is known about the baiji, I recommend Lyall Watson's (author of Supernature) book, Whales of the World. One resoundingly positive aspect of all the effort made to try to preserve the baiji is that the Yangtze finless porpoise - also critically endangered and down to a few hundred, may benefit. It's highly likely that the baiji went extinct either this year or last year - with the Three Gorges Dam added to their woes, and all the former perils greatly increased, it does appear likely. Still, I really do hope to be wrong, though discovery of a remnant population is but a beginning in attempting to conserve this beautiful animal. Cetacean Society International Photo Gallery (lots of good pictures). These stories make me sad, though I would rather hear of them than not. I hope you are wrong, too. The story of the propellers, hooks etc. reminds me of our manatees, which are also in trouble, though not to this extent. Florida is overcrowded with boaters who are also tearing them up. Every manatee I've seen in news clips bears many scars. Our blatant disregard for wildlife because it is inconvenient to us makes me angry. Thanks, Aravis! As you say, the baiji and manatee share some common problems (and have comparable, strange, ancient lineages), though the baiji has the added disadvantage of relying on sonar. A friend and long-term correspondent in Florida (Hi, Silvia!) sent a wonderful picture book, Mary Manatee: A Tale of Sea Cows, that we read to J and L when they were little. Of course, Steller's seacow (a gigantic relation) became extinct in 1768 not long after discovery, a sad tale in itself. Disregard is a good way to put it - there's a whole range from careless indifference to actual conscious destruction of wildlife. Very interesting post, i dont know baiji, but is sad that one is extinguished.